As we all know Google is the main go-to-point for the majority of people’s Internet searches and has been for the past decade. It also looks like Google will be the main search engine in the years to come with the search giant constantly improving its search algorithm and looking to add new products and services to its extending portfolio. The other week Google released a video via its official blog which featured a video chronicling ‘The Evolution of Search in Six Minutes‘. 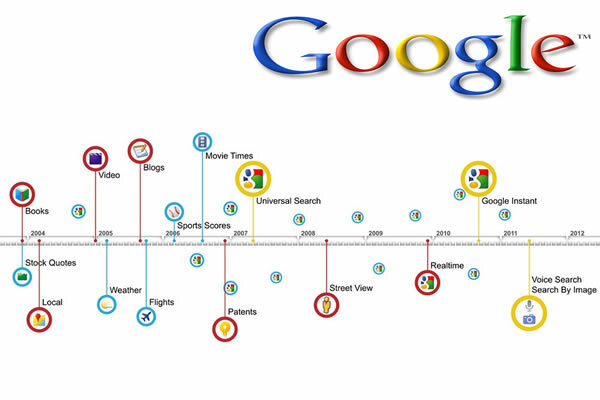 Some of the developments along the Google timeline. The company are said to make roughly 500 different improvements to search in a year and 2011 alone has seen big changes including the much talked about Panda update which is said to have affected 12% of search results and crack down on sites with poor and duplicate content. Other changes over the past year include multiple updates to the Panda algorithm, the introduction of the +1 button, expanded site links when searching for brands and a ‘freshness’ update that focussed on returning recent content. An interesting point mentioned in the video is how the terror attacks of Sept 11th inspired Google to improve search results to return the latest news. When entering “the Twin Towers” as a search term, the results returned were sites with information about the buildings and not news about the attacks. This led to the development of Google News results to provide users with up to date news with multiple points of view. Since the web has develop at such a fast pace with images, video, blogs and products appearing on more and more sites Google developed Universal Results to give search results that also covered the rich web to make sure users were also receiving these types of content in their search results. Other major introductions included paid adverts appearing with the search results in the form of AdWords and Google Instant with the goal to provide quick answers as users are typing in their searches. Google looks set to continue its dominance of the search engine market with continued improvements such as the ability to drag an image into the search area to get results and voice search which will have great benefits for mobile phone users. To be sure you stay on top of these improvements and changes then get in touch with HeadRed’s search engine optimisation team.